While reading Merzbacher’s account, I looked at my map of Charles Howard-Bury’s journey in the Tian Shan (posted previously) and discovered I too had Khan Tengri in the wrong place! So I did a little homework to make sure I had it moved it to the right place, because not being sure where Khan Tengri is located should be the kind of problem they only had 100 years ago, right? Well, maybe not. 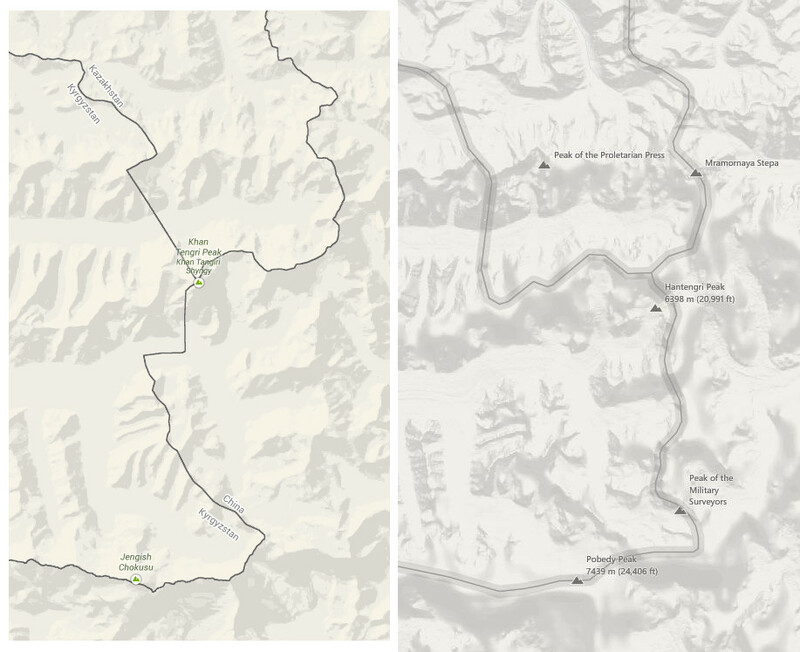 Let’s compare Google maps, on the left, and Bing maps on the right. Wow, that’s some pretty serious difference. Not only is Khan Tengri in a different place (relative to the glaciers, for example), but the Chinese-Kyrgyz border is also in a different place. In Bing’s world the border runs atop the highest peaks, while in Google’s the upper portion of the South Inyl’chek glacier is actually in China. Bing, by the way, is using Russian peak names, like Pobedy Peak, while Google has its Kyrgyz name, Jengish Chokisu. Turns out that OpenStreetMap has the same border Google does; but Yahoo and Here have the border that Bing does! A quick web search reveals that China and Kyrgyzstan settled their border disputes in 2009. It’s likely that one of the sets of lines we see above dates from prior to that settlement, and one from after. But which is which? Administrative boundaries downloaded from GADM and DIVA indicate that Bing/Yahoo/Here are actually more up to date. But as far as the location of Khan Tengri is concerned, I’m afraid Google/OSM are correct.